When a fur trader dropped his axe into a remote Cariboo lake, he probably never suspected that it would be the basis for the name of Lac La Hache. Lac La Hache, British Columbia, "The Longest Town in the Cariboo", is located about 20 km (12.4 mi) north of 100 Mile House on Hwy 97, and stretches along much of the 18 km (11 mi) lakeshore. The lake is well known for its kokanee fishing as well as it's trophy size lake trout. During the summer months, the Lac La Hache area attracts anglers, boats, swimmers, and water skiiers. Many resorts, offering camping and cabins are located on the lakeshore, as well as a British Columbia Provincial Campground. Close by, Timothy Lake is a popular holiday destination. In the winter, Mt.Timothy offers downhill skiing, and the area is a favourite for snowmobiling, cross country skiing and ice fishing. 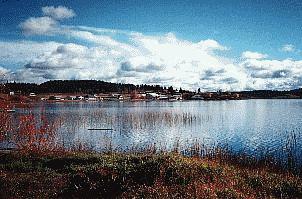 The town of Lac La Hache, BC, offers full services.